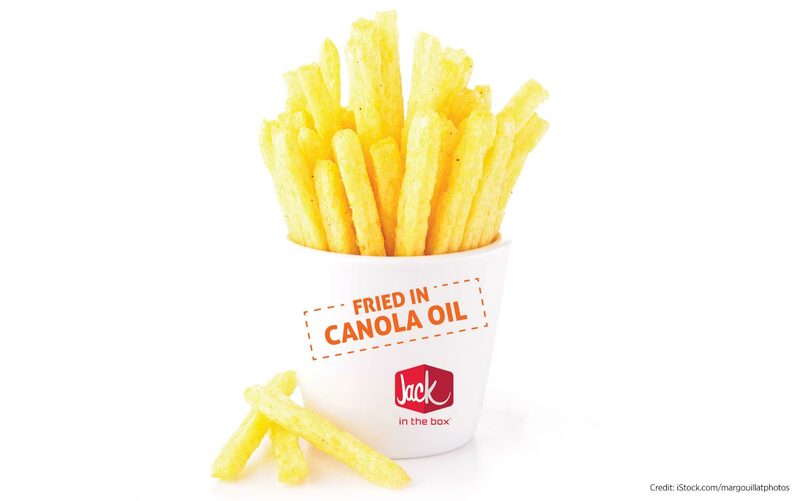 Fast-food chain Jack in the Box switched its frying oil to high-oleic canola oil. Why? And what will keep it that way? American fast-food chain Jack in the Box has 2,200 restaurants, each with three to five fryers holding 30 pounds of oil. All of it is canola oil. Jack in the Box fries 15 menu items – including french fries, of course, but also egg rolls, jalapeño poppers and tacos. “Craveability” is basically the company’s motto, and it drives their decisions. They use a “salty, hot and delicious” menu to meet the craveability goal, and the bank of fryers in each restaurant plays a central role. “Oil quality has a dramatic impact on the quality of our final product,” Pugh says. The decision to use high-oleic canola oil was not taken lightly. Jack in the Box was using partially-hydrogenated shortening but, like many other quick service restaurants (QSRs), was driven to switch by new regulations in many states that put a limit on trans fat content in food. Jack in the Box started testing canola oil in 2008. In a recent review of its oil source, Jack in the Box tested 45 different oils and oil combinations at Cargill’s innovation centre in Fort Collins, Colorado. In a recent review of its oil source, Jack in the Box tested 45 different oils and oil combinations at Cargill’s innovation centre in Fort Collins, Colorado. “We looked at corn, cottonseed and soy oil as well as canola oil, and various combinations of them all – including 60:40, 50:50 blends,” says Rochelle Perez, manager of the Jack in the Box quality program. In the end, the company went with high-oleic canola oil. For Jack in the Box, Cargill’s high-oleic canola oil met its flavour goals at the right cost and fry life. Fry life is huge. Jack in the Box does all it can to extend fry life while producing food with consistent taste and colour. Fryers are set at 365°F and each fryer in a restaurant has a specific role: One for fries, one for tacos and one or more for chicken, onion rings and jalapeño poppers. Each fryer is filtered twice a day and skimmed every 15 minutes. Manitoba canola grower Jason Claeys and Cargill’s Irena Hall stand outside a Jack in the Box restaurant in San Diego, California. Fast food restaurants can’t change prices quickly, so they want to keep market prices for their input ingredients as consistent as possible. “If we can price 24 months out, we will,” says Derek McNamara, senior purchasing manager in Jack in the Box’s commodity risk management department. He is responsible for pricing all ingredients, including oil, meat and salt. Cargill, with its integrated supply chain, works with customers like Jack in the Box as well as growers to keep both sides interested. Claeys was impressed with Jack in the Box’s oil testing and selection process, its long-range pricing and continued evaluation. “There is so much going on behind the scenes just to make some fries,” he says. 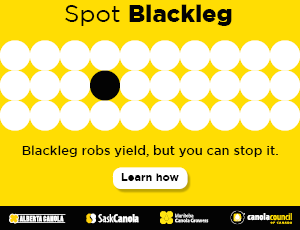 22 million total acres of canola, one third of which would be high-oleic and other specialty types. 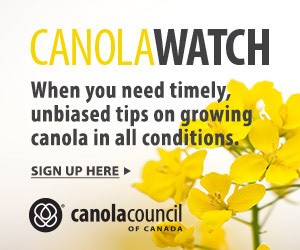 Currently, about one eighth of Canadian canola acres are seeded to specialty oil varieties. Erik Heggen, president of refined oils North America with ADM, says the transition away from partially-hydrogenated vegetable oils at QSRs in the U.S. has improved demand for specialty canola oils. Partial hydrogenation creates trans fats, which are seen as negative for human health. QSRs and food processors also consider labeling goals (low saturated fat, for example), nutrition, sustainability and – importantly – functionality when choosing an oil, Heggen says. High-oleic canola oil can meet the need in some cases, but it has lots of competition. Corn, peanut, cottonseed and NuSun sunflower oils are naturally stable. High-oleic versions of soybean and palm oil are also available. “High-oleic palm is not prevalent now but could be a big deal,” Heggen says. “Clean labels” are another consideration in the decision, notes Heggen. Some food processors don’t want to have palm on their labels. Some want to be trans fat free. Others want to be non-GMO. The current advantage for high- oleic canola oils, Heggen explains, is their low saturated fat content, blendability and consistent price and supply. “Consistency of quality and supply is worth a lot to the food industry,” he says. Moving toward the Canadian canola industry goal of seven million or so specialty canola acres by 2025 will require growers, obviously, but is that goal realistic? That’s the kind of thing Jack in the Box would watch for – perhaps as a way to keep its younger clientele coming back for years and years.